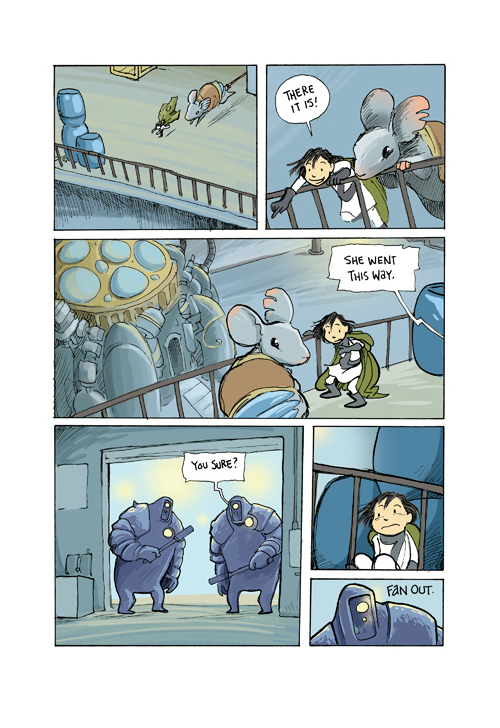 If you missed this 2011 7-Imp post, let me quickly summarize for you: Zita’s first set of adventures—Ben Hatke’s Zita the Spacegirl, released by First Second Books last year—is the story of a girl who lives on Earth but is transported to another planet when her friend is kidnapped by what can only be described as an alien doomsday cult. 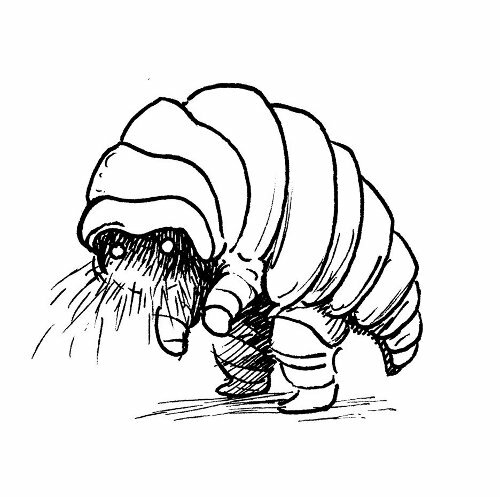 In the new world, she meets warrior robots; giant mice; mechanized, spider-like predators, out to get her; a mysterious man, also from Earth, named Piper; a large, lumpy, friendly creature named Strong-Strong; and the Scriptorians, the planet’s first inhabitants, who intend to use Zita’s friend Joseph as a ritual sacrifice to prevent the destruction of their planet. Whew. When it’s all said and done, Zita must make a huge sacrifice in order to help her friend. And, boy howdy, does the whole thing end with a big, juicy, delicious cliffhanger, too. Zita, installment number two, doesn’t disappoint is what it boils down to. Our beloved protagonist is fearless and her adventures are thrilling. Or, in the words of Madrigal, Zita shines in a crisis and inspires loyalty. Yes. That, too. 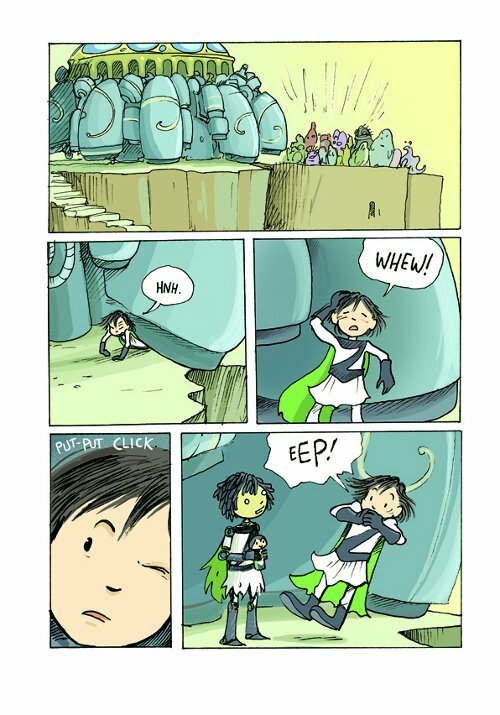 On that note and with regard to this wonderful comic at Ben’s site, I have to say that Zita’s adventures went a long way in teaching my six-year-old how to read, given her immense devotion to the books. 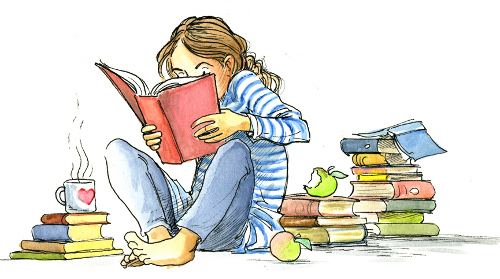 Now, my first child came out of my womb with a book in hand and nearly went from not-reading to reading fluently, but the six-year-old is learning to read as most children do, and I mean to tell you that she rips through these—way more than most books—because of her giant crush on Zita. To be clear, both girls are bananas over these books, but it’s remarkable how far the two books went in engaging the child still working her way around words in books. 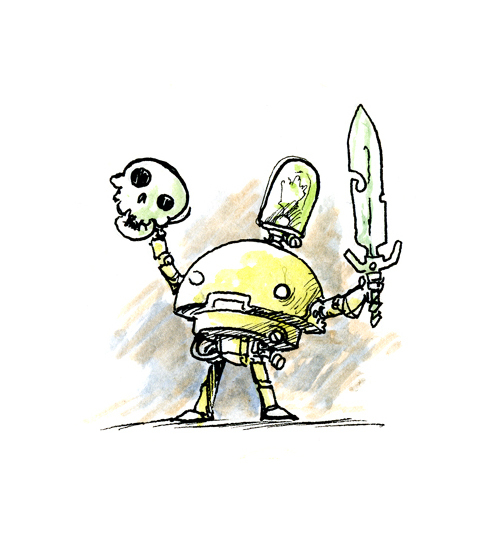 Ben shares lots of art and early sketches from the new book today. 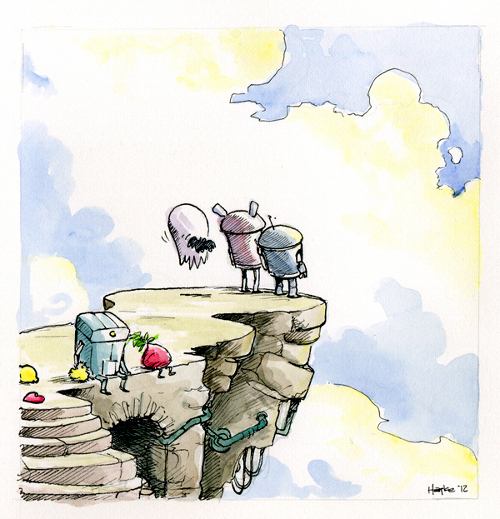 I thank him for taking the time to visit 7-Imp again (especially for taking the reins on this interview, which he really did, given my busier-than-normal work schedule right now). Jules: To start off, can you tell us what kinds of things are on your desk right now? 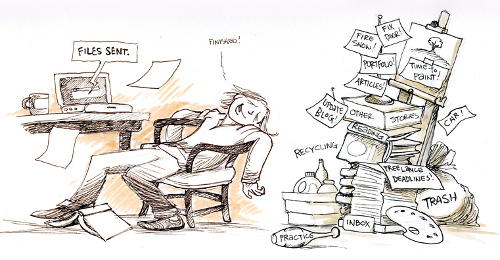 Ben: My desk is overflowing! Right now, it’s a big mess of sketchbooks and paints and great stacks of comics pages, books I’m reading, and little gifts my kids bring me throughout the day. And a couple minutes ago there were cookies on my desk. Jules: What’s your most interesting kid-gift of late? Ben: Angelica has been making these rainbow-painted, cut-out birds, all top views, that she affixes to long, thin sticks so that their wings flap. I get those when she’s finished flying them. I also get flowers, and I have a painted stone turtle doorstop. Jules: You mentioned books you’re reading. What are you reading right now? Ben: With the girls I’m reading James and the Giant Peach and The Hobbit. Both are classics we revisit every couple of years. I just finished 11/22/63, which was the best Stephen King book I’ve read in a long time. It’s an interesting and surprisingly romantic time travel story. I also recently read The Reapers are the Angels by Alden Bell — a zombie story. Right now I’m reading A Canticle for Leibowitz, which is a strange and interesting tale about the ages after a nuclear holocaust — with monks! Jules: I have to ask, since you mentioned The Hobbit. Are you eager to see the film adaptation this Fall and will you take your children, or are you so devoted to the book that you’re too nervous to see it? Ben: Well, I guess the truth is the latter. I’m one of the people who was not a big fan of the LOTR trilogy, thinking it missed the point of the ending, especially, by a wide mark. Then the trailer for The Hobbit came out, and darned if I didn’t find myself getting excited! I liked the idea of Guillermo del Toro doing it, but I still thought “yeah, this could be fun.” It looked in the spirit of things. But now he’s splitting it into three movies. That’s troubling. Does this make me a grouch? Jules: And the comics on your desk? Tell me about those. 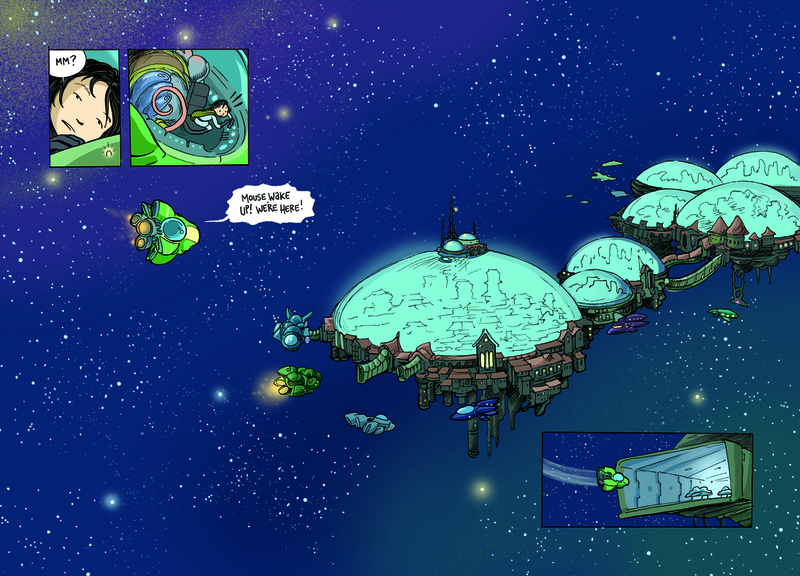 Ben: The biggest stack is the inked pages from the third Zita the Spacegirl book. I worked full steam on that story over the summer. I feel like with this third book I’m finally gaining some real cartooning confidence and it’s been a blast to work on this story. 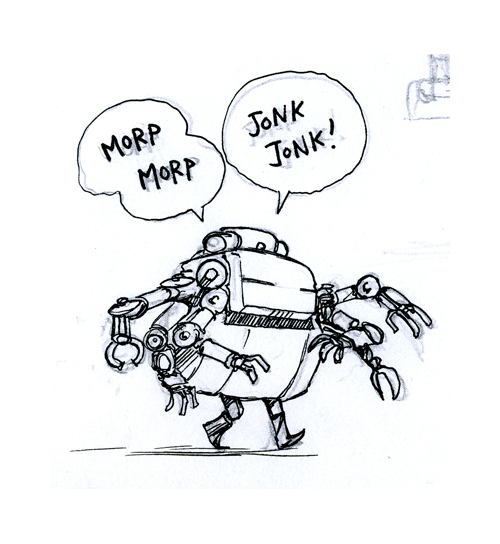 I have a sketchbook that’s nearly full to the gills with concept art. 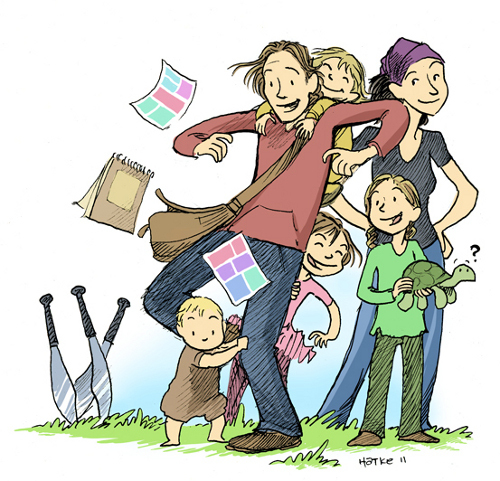 Most of the other comics are either my “True Dad Stories” (basically journal comics) and my prosaically-named “Robot Comics.” Both are done in comic strip form for my blog. Like most comics-lovers, I got into comics through the newspaper comics strips. When I was growing up, I used to make my own comic strips that were very similar to Garfield and Calvin and Hobbes. 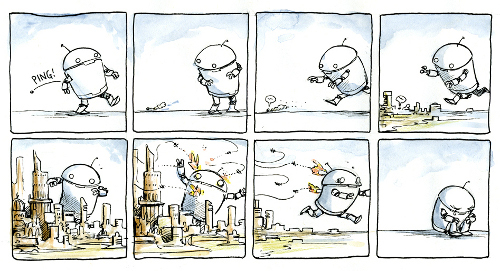 I went on to make long-form comics (graphic novels and short stories), but I still love the format of the strip. It’s limiting, but within those limits you can do some pretty fun things. 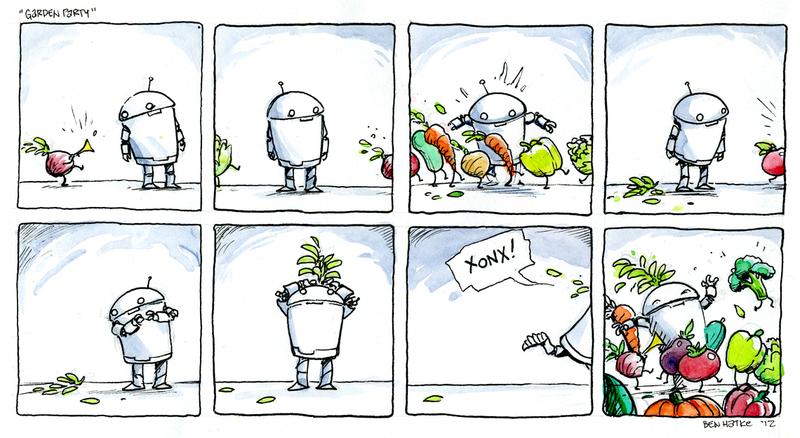 The robot comics are my return to, and exploration of, the comic strip. 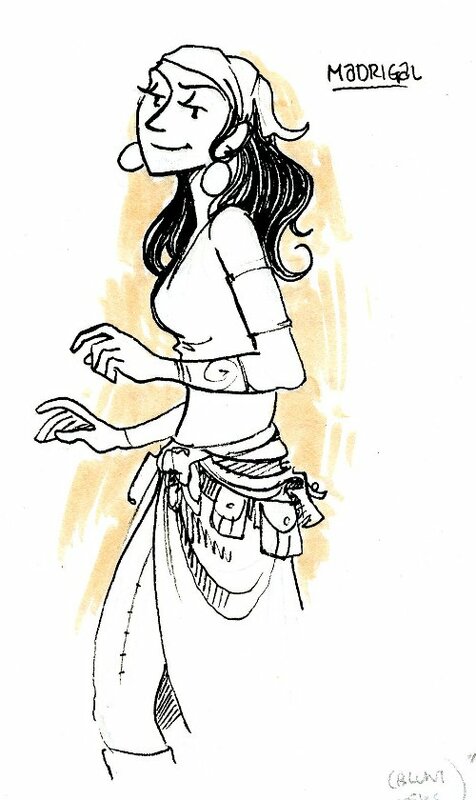 Jules: Can you tell us one sneak-peeky thing about Zita 3? Just one, tiny thing? Ben: Oh, I want to tell you all about it! But I can’t. Okay, I will tell you this one thing: One of the characters is a skeleton. Jules: Let’s talk about Zita 2. Ben: Yes! It’s the new Zita adventure that was released on September 4th. Zita’s on a quest now to find a way back home to Earth, but she’s going to run into some complications. There’s more action in this story, and we meet some new characters. There is also actual space travel in this volume. I’m very eager to see what people think of this continuation of the adventure. I had the opportunity to sign and give away a few advanced copies at TLA and IRA this year, and my friend Dave Roman was laughing about how ridiculously eager I was to see people reading this book. Jules: Was it challenging at all to work on the sequel, or did the ideas just flow? Ben: The ideas did not flow AT ALL. This book went through many drafts, some wildly different, and it took much longer than I ever expected it to. I know that—because I get to write and draw and paint and make comics for a living—I basically waive my right to complain about anything, but still … The day I turned in Zita 2 was one of the best days of my recent memory. It was a perfect September day and I had my wife drop me off in a small town nearby. I went to the Dollar Store there and bought a bunch of snacks and then hiked home along the railroad tracks through the woods. I waded across the Shenandoah river. It was awesome. Jules: You mentioned that there were paints on your desk. 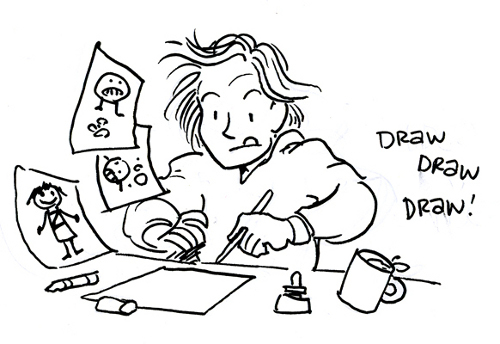 How exactly do you create your art? 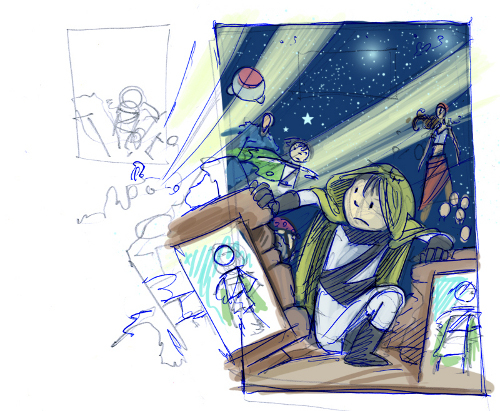 Ben: For the Zita books, I create black and white pages, scan them, and color mostly in Photoshop. In a few of the pages, I get fancy and give them a light wash, but mostly the colors are digital. 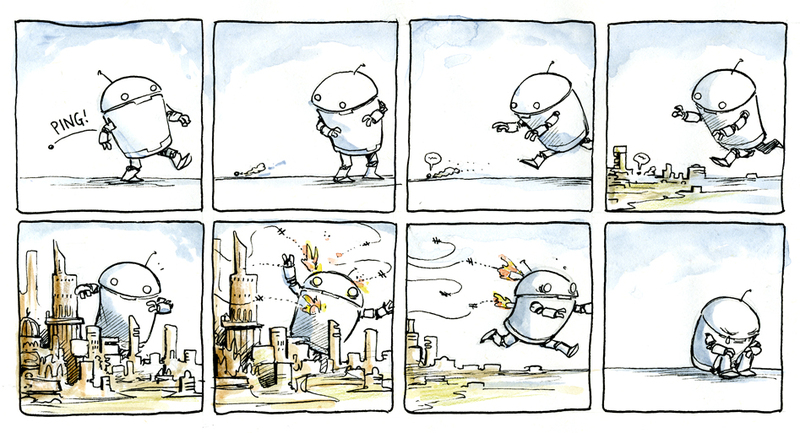 Smaller comics strips are inked and then colored with various watercolors. I keep the colors loose. You can do a lot digitally, but in the end nothing beats nice paper and nice paints. 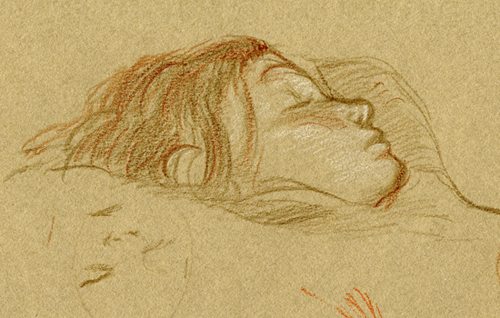 Jules: I remember from our last 7-Imp chat (2011) that you also studied a little bit in Italy. Do you still paint in oils? Ben: Yes, I still do oil paintings whenever I can, but not nearly as often as I’d like. We went back to Italy this year, though, and I managed to get out this summer and paint a few landscapes. No portraits or figures, though! 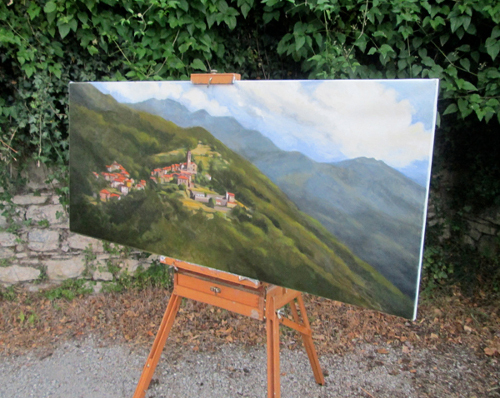 My best painting project from this summer was a large (4-foot) landscape of Gravagna that I made for my wife. It was a present for our eleventh wedding anniversary. Gravagna is the little village where her father was born, and I wanted us to be able to take the village home with us, at least in a small way. Jules: What’s next for you? Ben: Oh, I have all kinds of plans! I do a small, self-published yearly print collection of my journal comics, personal illustration and things. 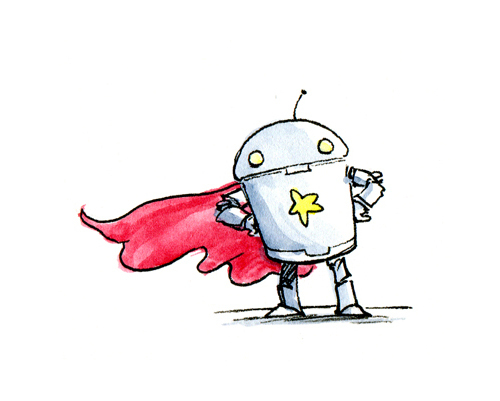 I’m also working on a picture book for Macmillan. That’s the project I’ll be jumping into immediately after Zita 3. Jules: Ooh! Picture book! Can you talk a bit more about that, or is it too early? Ben: It’s too early to talk about it just yet! 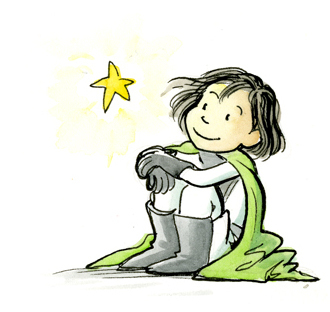 I’m feeling very aware that I’m in new territory with this — and respectful of how tricky it is to make a really GOOD picture book. Jules: So, what happened to the cookies that were on your desk? Ben: I ate them! Would you send me some replacements? Jules: Only if you and your family squeeze me into your suitcase for your next trip to Italy. Just tell me your favorite kind of cookie, and I’ll get my travel gear ready. Ben: I am really partial to amaretti these days. Mmmm. The Eight-Year-Old [jumping up and down a lot]: Oooh! Ooh! Ask him: Why are your books so awesome? Ben: Ha ha! Maybe we just like the same types of things! The Six-Year-Old: Ask him: How do you make your words so funny? Ben: You know, I put a lot of thought into how a character speaks, and the real, honest truth is that I do a lot of the voices out loud and then try to write it with the voice I was using. 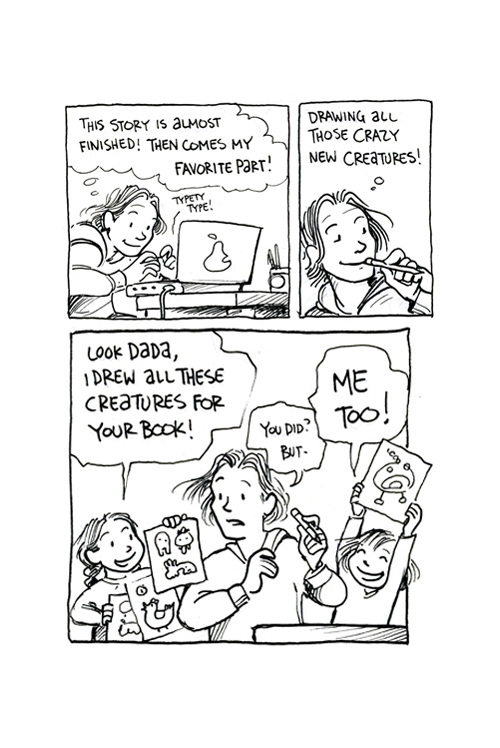 Both of Jules’ Imps: How many Zita books will there be? We want a whole series. Ben: Will you be angry if I tell you that Zita is a trilogy? 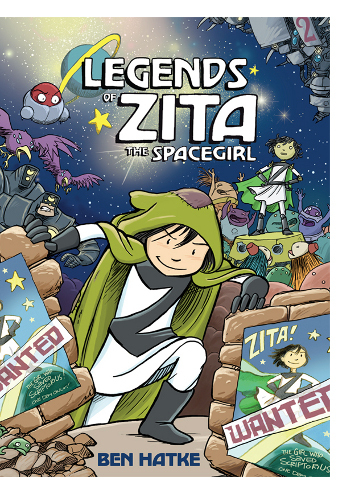 LEGENDS OF ZITA THE SPACEGIRL. 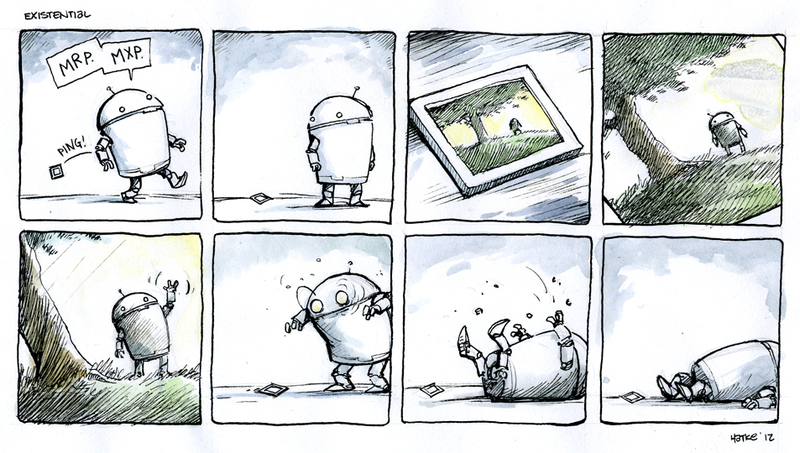 Copyright © 2012 by Ben Hatke. Published by First Second Books, New York. 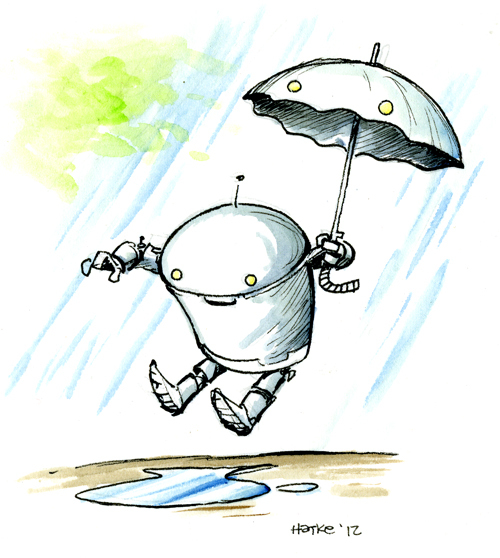 All artwork and sketches used with permission of Ben Hatke. so so great! Thanks for this interview! Wow. Thanks for sharing this interview. The only other thing I might have asked for would be a link to his web-site directly or more info on where to find/buy the books. It looks epic! Teasha: His website is here: http://www.househatke.com/. I linked his name in the first paragraph to his site, but sorry that wasn’t more clear. I’ll go edit and link a few more times. Thanks Jules! Uh, yeah, after I posted when I was re-reading I moused over and figured it out. I was just too blown away by the fabulous artwork to have picked up on the first time. Oops. I hear ya. Great stuff, isn’t it? 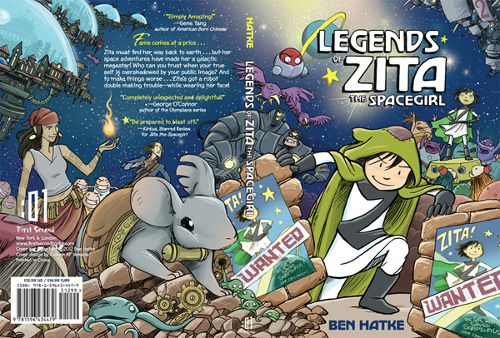 Thank you so much for showcasing Ben Hatke, his art and Zita. All three are marvelous. I need to get my hands on Legend as soon as possible. I love the humor expressed in his robot comics. What a happy way to begin my Tuesday. Great interview! We’re big fans of Zita around here. That excellent landscape painting looks like concept art for a Miyazaki film — it reminded me that I saw lots of homage-nods to Miyazaki in the first Zita book. Maybe if Ben is paying attention here, I’d like to hear more about that influence (if any!). 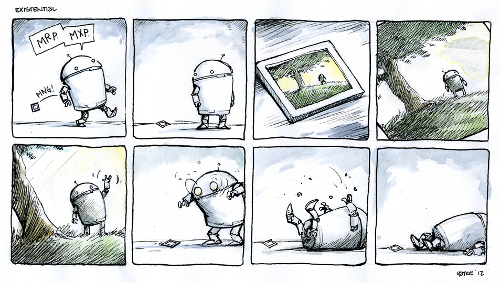 The comic with robot picking up the bolt and falling apart…made me laugh out loud. So funny! The landscape, though, was painted directly from life. For a couple weeks I walked the canvas a mile or so away to a hilltop and set it up on a portable easel and just looked at the village and tried to get it down on the canvas. 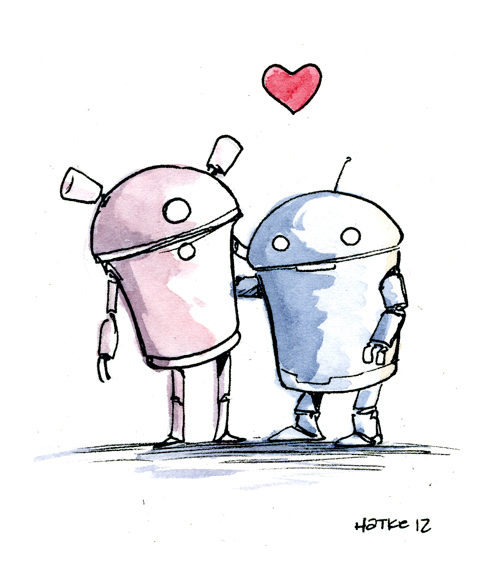 I like the family portrait and the Robot Comics especially. Congrats on Zita 2! Zita 2 is in the house! 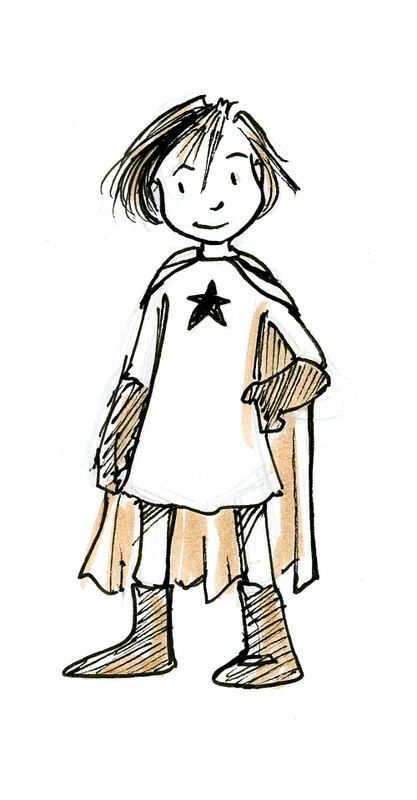 Zita 1 was the first whole book my daughter read, back when she was in first grade. She enjoyed the story, but struggled through the reading of it. By the end of that summer before 2nd grade, she asked to read it again, and zipped right through it. The pictures posted here were delightful, and I want Ben to come to our house. 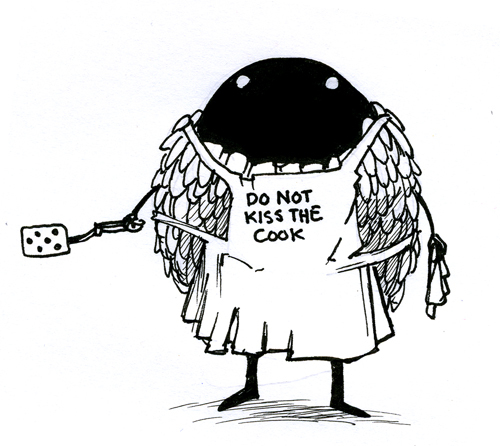 We can arrange for cookies, too, you know. Fantastic, thanks for the illuminating response Ben. And to be clear, you’ve obviously developed your own distinct style — I just saw echoes of some of his character designs in your stuff. 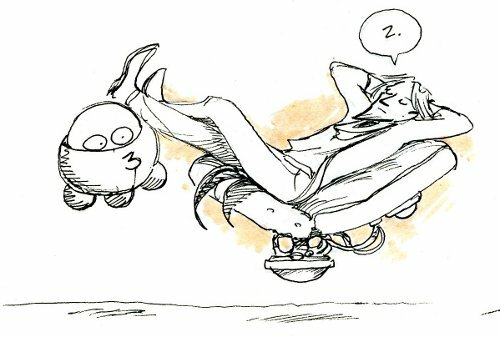 I’d say the same for Kazu Kibuishi — unique, but channels some of the warmth and wonder of Miyazaki’s vision. For our family, the gateway drug was Totoro, and I couldn’t believe the long, lingering wide-angle shots of grasses and clouds and trees, and the beautifully detailed architecture. There’s a certain reverence for landscape and nature that you don’t often see elsewhere. Thanks for the great interview. As a 53-year-old kid I’m a big fan of Zita. I actually got into the character when Ben posted some strips online, and I’m sorry to see that they’re not all there anymore. Hopefully someday, somewhere, the tale of Zita and the perfect sandwich will resurface, but until then I’m eagerly awaiting Book 3.